Fade in and out filters have been added as of version 14.03.01. There are 2 video filters - Fade From Black and Fade To Black - plus 2 new audio filters: Fade In and Fade Out. The video filters support GPU processing if you can use that. 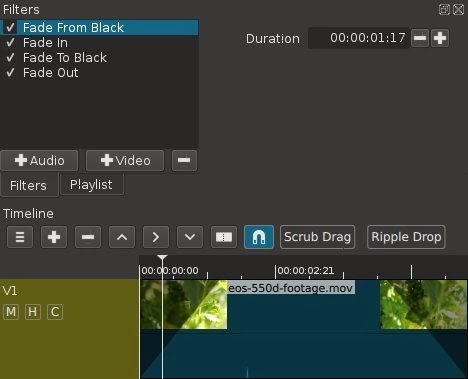 As you can see in the screenshot, fade conrols are available on the shots directly on the timeline making it very easy and convenient to add the filters and adjust audio+video in a tandem/ganged fashion. Simply move the mouse pointer to the top-left corner or top-right corner of a particular shot to make a pulsating circle appear. Then, click and drag the circle control horizontally to drag-out a fade rectangle. But that does not mean you have to use the timeline to utilize these new filters. If you are simply working with a clip or playlist project, you can still apply and use these filters. And before you ask, no, this update does not include or support cross-fading audio or cross-dissolving video. That is coming next.